Garcia-Planas, M.I. 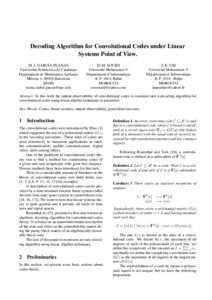 ; Souidi, E.; Um, L. E.
In this work the output-observability of convolutional codes is examined and a decoding algorithm for convolutional codes using linear algebra techniques is presented. In this work the output-observability of convolutional codes is examined and a decoding algorithm for convolutional codes using linear algebra techniques is presented. Garcia-Planas, M.I. ; Souidi, E.; Um, L. E. Decoding algorithm for convolutional codes under linear systems point of view. A: Wseas International Conference on Circuits, Systems, Signal and Telecommunications. "Recent Advances in Circuits, Systems, Signal Processing and Communications". Arona, Tenerife: WSEAS Press, 2014, p. 17-24.